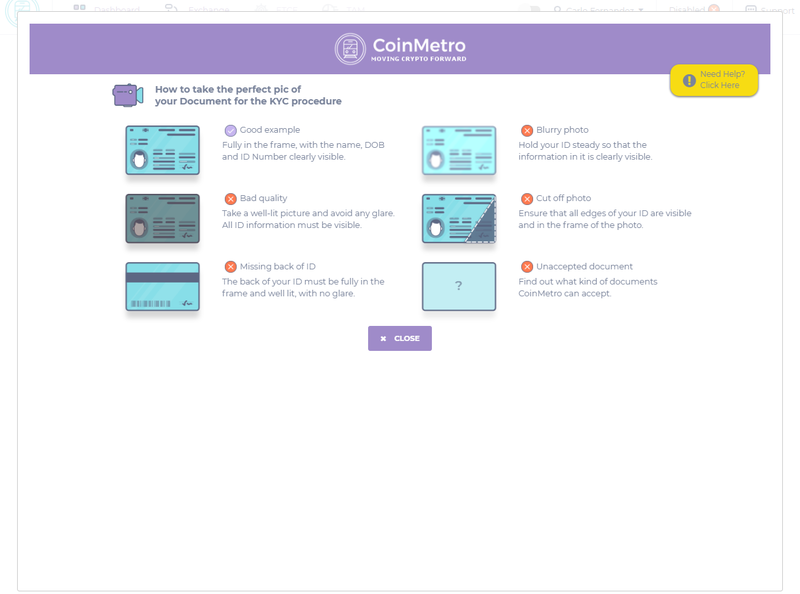 CoinMetro has implemented a KYC procedure to respect rapidly evolving international regulations and to protect itself and its clients. 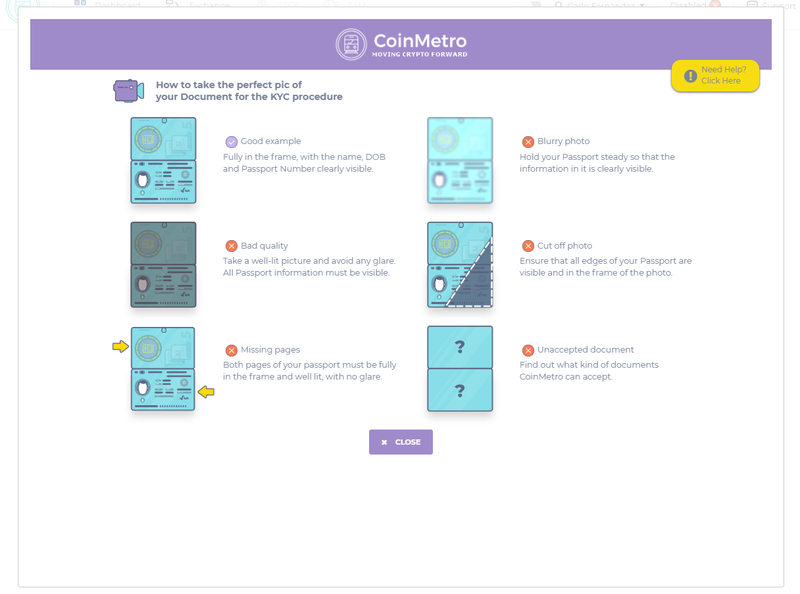 By following the KYC procedure, you will be protected from legal risks and will receive a more stable level of service. What Kind of Identification Documents Are Acceptable? NB. We cannot accept anything other than the above-listed documents as proof of identification, these may vary from country to country (In which driving licenses are accepted). Scanned documents are not acceptable. Upload using a JPG, JPEG file format for optimal results. What Documents Count as Proof of Address? A landline phone (not mobile) or internet bill, with official company markings visible, e.g. logo, address, stamp etc. Income tax letter (if issued within the last 12 months). NB! We cannot accept anything other than the above-listed documents as proof of address. All edges of the document should be visible in the photo, and the document should fill most of the frame. Screenshots, pictures of a picture or a document, or photos of computer screens are not acceptable. NB! These documents may ONLY be used if they contain a clear and up-to-date address, and must also not be more than three months old. What Languages Are Be Accepted? Documents can be accepted in the following languages: English, Estonian, Spanish, Russian, French, Italian and Portuguese. For documents in all other languages than the above, a translation performed by an officially appointed translator /state-authorized translator will be required. In countries where ID documents of private individuals do not bear any signatures, the individual must sign the ID copy, and the signature should be certified together with the document. In case an ID document does not bear an expiry date, the embassy or consulate of the relevant country may be contacted to confirm legitimacy. If you are a US accredited investor, under Regulation D of the US Securities and Exchange Commission (SEC), you are required to provide a tax or income statement to submit your KYC application. As an extra security measure, we will be doing a final, manual review of the documents. This process can usually take up to two weeks, but it may take longer due to the high number of requests that we’re receiving at the moment. Once completed, we will send a confirmation email to you. In this case it’s likely that you document was scanned, was cropped, blurry, with glare or a combination of the these. Please refer to the 'Proof of ID Photo Instructions' section presented in this document. Please replace your declined document with a new one which clearly shows the image above. If this happens, it’s likely that the proof-of-residency document you sent to us is outdated, has no address on it, or it’s not legible. Please replace your declined document with a new one which clearly shows your current home address and is not more than three months old. If you have any questions, please don’t hesitate to ask them on our live chat or get in touch with our support team.